Nanking Cherry is a fruiting cherry bush that produces edible cherry fruit for both wildlife and human consumption. The fruit of the Prunus tomentosa is commonly used in pies and jellies and is a good choice for wildlife plantings and windbreaks. Nanking shrubs are moderate in longevity, having moderate water requirements, and a low salt & alkali tolerance. Plant 6 to 8 feet apart for hedges or windbreaks. 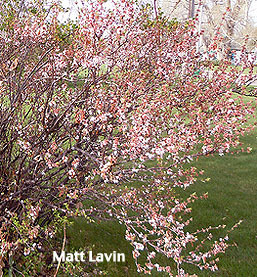 This cherry bush is a tough flowering shrub that it will even grow under semi-arid conditions and still endure a snowless winter of -40°F. Generally, these cherry plants grow about 8 feet tall and equally wide producing grape size fruit between sweet and tart in flavor. Thank you to Matt Lavin for the use of this plant image. Please Note: We will not ship this plant variety into CA, CO, WA, AZ, OR due to Department of Agriculture restrictions.